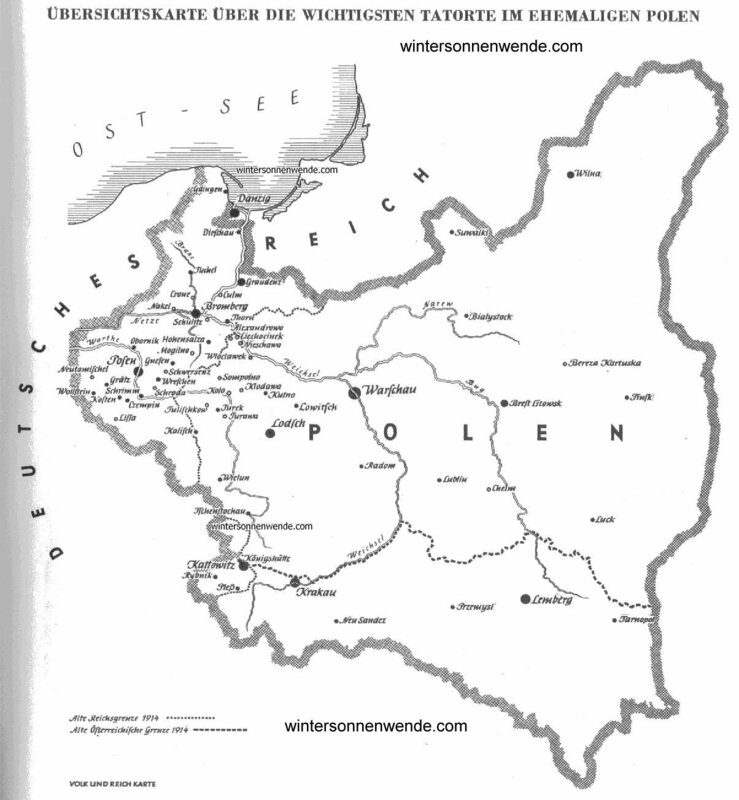 Death in Poland: The Fate of the Ethnic Germans. - Chapter 9. Edwin Erich Dwinger. At the time this death march left for Piecky, the one that included Dr. Kohnert had already been on the road for two days. This group had been assembled in the Reich War Orphanage, a multi-story building with many large rooms and a long garden that stretched behind the house. Already on the first day of the war its rooms had begun to fill with prisoners, but at that time the arrests were still being carried out in a normal manner; the general psychosis did not descend upon the country until September 3. In those early days the arrests generally took the form of a police officer entering the "suspect"'s home, searching it, confiscating all radios and finally demanding the home owner's signature on a piece of paper to confirm that the house search had failed to turn up anything of interest. In most cases this ticket doubled as the arrest order. Some Germans were instructed to keep it as ID, but usually they were arrested on the spot. Three kinds of tickets were issued during this wave of arrests: the first were red and were given to those to be arrested, the second were pink and were issued to those to be interned, and the third were white and went to those to be evacuated - but nonetheless all three kinds of prisoners were treated exactly the same. Later it turned out that the recipients of the red tickets were the most hated, and accordingly, they were the most likely of all to be shot. In the evening of the first day of war, then, the orphanage is already half full, and new prisoners are brought in all night long. Many of these early arrivals were able to bring some luggage: well-packed backpacks, baskets with food, items that revealed at first glance that they had been readied long ago on the basis of some sort of premonition. But only the first were arrested in this orderly manner; the later the hour, the less prepared the new arrivals were. Many of the last of them did not even have a coat, they came shuffling along in their slippers. However, the streets themselves were still calm at this time. Since all contact with the prisoners was prevented once they had been arrested, the Germans themselves had no idea of the scope of the arrests and anyone who had not yet been personally affected continued on in blissful ignorance. On September 2 Dr. Kohnert, the well-known leader of the German Organization, is brought in. He is a slim, strikingly tall man whose long face and light eyes hint at unusual energy and an ironic wit. He is silently directed to assume leadership of the prisoners, and from the very first day he devotes himself selflessly to their benefit, an undertaking that soon becomes an ever greater risk to his own life. That same day, Adelt arrives, and with him the young Baron von Gersdorff, both of them leading men in the ethnic German movement. More and more acquaintances meet up in the orphanage rooms, and it soon becomes clear that those ethnic Germans who had been politically active had been arrested first. The first bombing attacks are flown on Bromberg on Saturday around noon, and the crash of the detonations pierce even the pandemonium of the overcrowded rooms. Everyone rushes to the windows, hoping to see one of these nearby explosions or maybe even a German flier himself. But instead of German pilots they only see German peasants who are just then being herded past the orphanage. For the first time they see that these peasants are being herded along to brutal blows with truncheons. A few women cry out in horror, one of them collapses in an epileptic fit and continues to shriek while lying on the floor. Instantly the guard soldiers' brains short-circuit, and they force themselves into the rooms from every side with their bayonets fixed and force everyone to drop to the floor where they stand. "Anyone who gets up will be shot!" one of the officers screams. And so they lie on the floor, almost on top of one another, stare aghast into their guards' faces, almost unrecognizable with agitation, and at that moment they sense for the first time what kind of storm clouds are gathering inescapably on the dark horizon of their future. At five o'clock in the afternoon everyone is herded outside and made to line up in rows of twos in the backyard garden. A few soldiers from Haller's Army approach, select some prisoners simply on the basis of their looks, and handcuff them together in pairs. With clever insight they have managed to identify almost all the leaders. Then an officer arrives on the scene, orders everyone to form a square, has his men load their carbines in plain view, and then calls in a hoarse voice that anyone attempting to flee would be shot at once. Then the crowd marches out in rows of four; the first column to move out are the men, then the women follow. All in all there are eight hundred people from all walks of life: lawyers walk beside laborers, servants beside secretaries. All ages are represented as well. There are old men, and some women carry babies. There are some two hundred guards, one per line of four prisoners. The majority of them are the so-called strelzi (marksmen), a kind of paramilitary youth group to which almost the entire active Polish youth belongs. They had already been running around armed for three months or so, but acted more like louts than like a real danger. The rest of the guards are from the regular police force, to whom some auxiliary policemen have been assigned. These are dressed in ragged civilian clothing and are recognizable only by their red-and-white arm bands. The Commandant of this marching column is the last Police Commandant of Bromberg, an older officer with an evil reputation, but at first he still shows some common sense and decency. The first stop is at the police administration building, located beside the police prison. In the back yard of this building everyone is allowed to sit or lie down for a bit. It will be the last rest before a long march. A step-like wall separates the prison from this yard, and the gloomy impression of the barred windows descends like a weight on their souls. No doubt they too will be behind such bars soon - and many of the men who had been in leading positions in the ethnic German community already know from bitter experience what it really means to be incarcerated in a Polish prison. And so most of the prisoners sit silently beside each other, the women on the right, the men on the left. Among those that do speak, the conversation is mostly about the arrest papers. They show each other their tickets and try to guess what the colors mean. One man who speaks Polish well translates one after another, and as it turns out, the red ones are doubtless the most dangerous to have, the pink were issued primarily to the Reich Germans, and the white ones to people in the Poles' good graces. "I'm just going to throw my red one away," says one young man. "Better not to have any, than this dangerous document." "It may be better, or it may not!" says another. "Maybe it's worst not to have a ticket at all." "Or maybe it's best..." the other retorts. "Besides, it's obvious that the lists that were used as the basis for the arrests were already drawn up months ago!" Adelt interjects. "Many women who are now married were arrested under their maiden names, and in some houses the Poles even tried to bestow such tickets on deceased people." "They must have been drawn up in late April," adds Dr. Kohnert, "because nobody who moved into the area later than that has been arrested." "Also, some people who moved to other houses were still being sought in their old homes!" Adelt speaks up again. "So that's a definite proof that all this was planned a long time ago. And besides, unlike everything else, these raids are so well organized that the Poles could not possibly have done it all by themselves. Sympathetic organizers from abroad must have helped them!" "It's said that in the cities in the northwest there were even trains at the ready," Dr. Kohnert says, "and it was only the rapid advance of our troops that ruined those plans. But now they say, better that the prisoners should all die than that the Germans should liberate them..."
"Do you think they'll catch up to us, our brothers, the German soldiers?" someone asks quietly. "I'm sure of it!" another whispers. "It depends on how quickly they herd us along," Dr. Kohnert speaks up again. "But the women... it's not possible..." another one whispers, appalled. "Everything's possible - at least in Poland..." says Dr. Kohnert harshly. Gradually night has fallen, and at last it is time to move on. As they exit the garden for the street, they see that there is already a wild mob awaiting them there. They have formed a sort of double-walled passageway for them to run the gauntlet through, and beat down on them with all sorts of objects. The brutish expressions on their faces are so alien that it is doubtful any of their victims would ever recognize them again. Only a few recognize a Polish physician, he is a well-known doctor in town, an acknowledged, intelligent man - what has gotten into him all of a sudden? He is literally foaming at the mouth, beating at the prisoners with both fists, behaving truly like a madman. The prisoners at the vanguard have the worst of it, they must literally break through these human walls, but fortunately almost all of them are younger people, mostly the tough leaders of the ethnic German community, they lift their arms protectively over their heads, duck and force their way through. The crowd hurls rocks, flings filth from the street at them and accompanies it all with a chorus of abuse whose main theme is the most vile and repulsive Polish curses. They pass the huge lumber wharf. The water gurgles to them softly, and some of them are already tormented by thirst but anyone who takes even a single step out of line is immediately beaten back by the strelzi with their truncheons. A fortune in rafted lumber floats off the wharf - they won't be able to help themselves to that any more, some of the Germans think, as though in a sort of inner consolation. 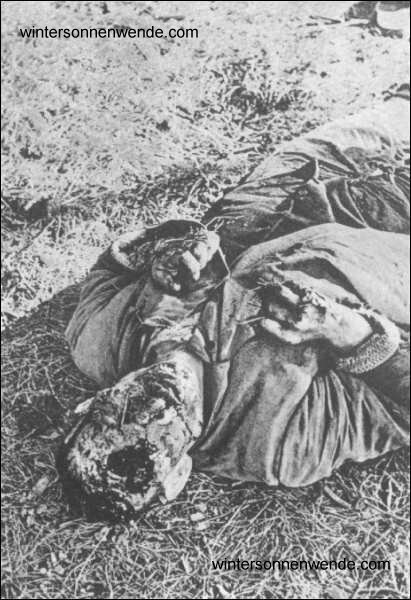 One of the murdered ethnic German farmers from the towns Langenau and Otteraue near Bromberg. The huge column marches on, passes through Schulitz, where once again a mob awaits them. Beyond Schulitz things finally calm down somewhat. The population of the open countryside has been much less infected by the general incitement than the city folk, and here the hatred of the farmers generally does not exceed vulgar curses. Every now and then the men light a cigarette - as yet they are still rich, they still have a few, but only one may be smoked at a time in each row of four. After a few drags each passes it on to the next, and there is no-one who takes even one puff more than his neighbors. And so the glowing red dots move back and forth through the night and their incessant movement gives a strange impression indeed. When dawn finally breaks and the wide-open countryside grows lighter, they witness their first air raid. The singing drone of a heavy bomber approaches above them. Instantly a mindless panic breaks out among the guards. "Into the ditches," they scream with huge anxiety, "into the ditches, right away!" They draw their pistols and raise their rifles, and the prisoners dash apart and throw themselves into the ditches to either side of the road. "Are they doing that for our sake?" one of them asks, baffled. "Of course not!" Dr. Kohnert says, amused. "Only to protect their own precious lives, and for no other reason than that! After all, the fliers might take our columns for troop transports and drop their bombs on us as the ideal target - and while that would only please the Poles where we are concerned, it would cost them their own lives as well! That's also the reason why we've been moving only at night, and will most likely keep moving only at night..."
"And during the days?" somebody asks. "They will pen us into a barn or shed, a thousand in a room just big enough for a hundred!" Adelt says bitterly. "At least that way we will actually get some rest..." says a seventy-year-old clergyman. "I've heard the Poles are already marching on Berlin!" says one young man softly. "If that were so, our fliers would definitely be here, of all places!" Dr. Kohnert replies with a laugh. "Then they would have other things to do than to fly one raid after another on Poland..."
Except for these air raids there is no rest for them. They must march fifty-eight kilometers in one stretch, for fifty-eight kilometers is the distance from Bromberg to Thorn, which the Commandant has evidently chosen as their destination. Already it is almost noon. The sun burns hot this day, thirst grows into severe torment, and ever more prisoners peer over the heads of those marching before them in order to at least catch a glimpse of the towers of Thorn. With relief lasting the space of a few breaths they see the silhouette of the old fortress, straighten their tired backs once more and forget the pain of their sore feet. Granted, another angry mob awaits them in the streets of Thorn, but by now they're used to that, it no longer intimidates them, and pressing closely together they run this gauntlet as well. Finally the hall of a suburban establishment takes them in, and in entire rows they collapse gratefully onto the bare floor.